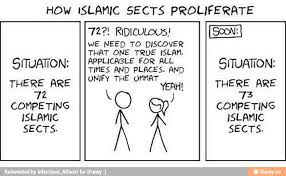 Does Islam have sects? I started pondering on this question last week, when someone new to Islam asked me how the official figure of 1.6 billion Muslims in the world panned out. While some scholars such as Dr. Zakir Naik may naively claim “Islam has no sects”, the truth is far from it as seen with the sectarian conflicts we are accustomed to nowadays. I also understand the viewpoint of such scholars in denying the fracture of Islam fearing a disappearance of the core essence of Islamic principles i.e unity of the ‘Ummah’ (Islamic community). The most obvious instance of this fracture is that between the Sunnis and Shias. The Sunni- Shia divide DID NOT exist during the time of the Prophet and only came about as a result of the ambiguity in choosing the Prophets successor as the leader of the ‘Ummah’ post his demise. While one group chose Abu Bakr Siddiq, the prophet’s closest friend, companion and father-in-law, another group that sheltered the prophet in Medina during his early years as a Prophet was of the opinion that only the prophet’s family should be rightful successors to the title of Caliph i.e leader of the Muslim people. Ali, the prophet’s son-in-law and cousin was therefore put forward by the latter group and later constituted to form the Shia of today. The division initially was only purely on the basis of allegiance and early Shia groups were no different that the Sunnis in terms of beliefs and Islamic theology. It can thus be argued that there was no division per se of Islam at the time. The actual rift we see today came about as a result of a sequence of events starting with the assassination of Ali by a fringe group known as the Khwajarites in 661 A.D to the murder of Ali’s son Husayn in 680 A.D by members of the then ruling Ummayad dynasty. Popular support grew for the family of the Prophet to take the mantle of leader and the Shias abolished the term Caliph and substituted it with a new title - Imam. Since then both the Sunnis and Shias have had various sub-sects form under them. On the Sunni side, the differences in the sects were purely on interpretation of understanding the Quranic laws and social framework, while on the Shia side, the differences were more on the line of succession of their Imams. In addition to this, over the past 1000 years, many new groups have emerged. Only a handful of those groups have survived to this day. Groups that differed from the core characteristics of Islam, i.e the concept of one God and Mohammed‘s (pbuh) claim to prophet hood were automatically not classified as Islamic and hence not considered. How they are different from others: All three are classified as Sunni groups and their differences are in the minute details of interpreting Muslim jurisprudence. 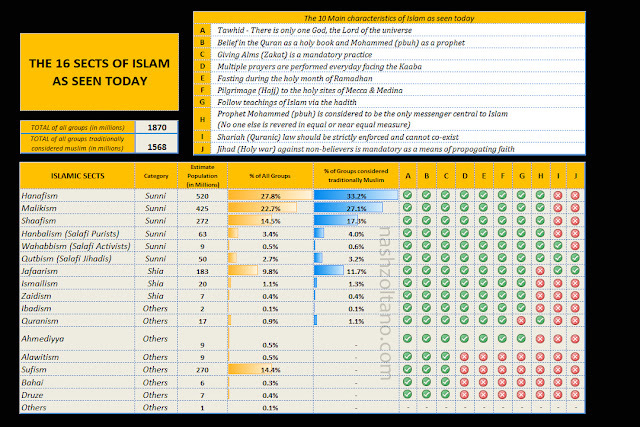 For instance – Time of certain prayers differs slightly between each of these groups based on the respective Imam’s understanding of the Sun’s position. Nevertheless, these 3 groups have seldom clashed and integrate into societies well. It should also be noted that Shaafism is predominately found in coastal regions of the world suggesting that it may have been the most common school of thought among Arab sailors in the middle ages. 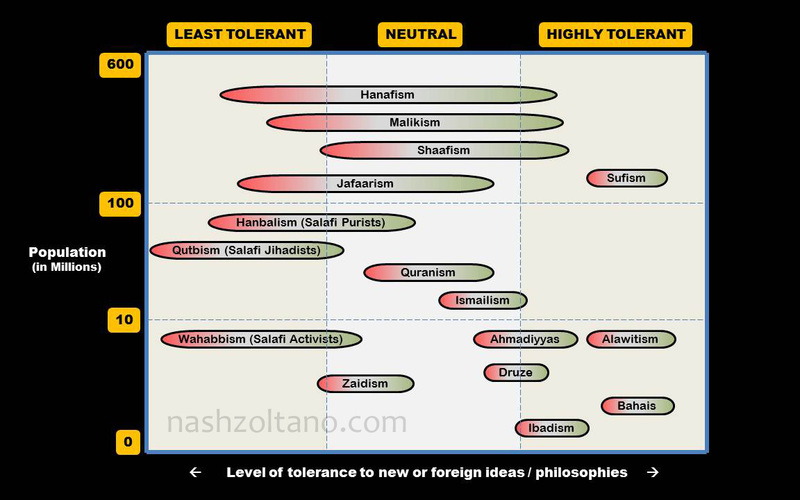 How they are different from others: Traditionally, Hanbalism was grouped as the 4th school of Islamic thought, however with the emergence of terrorism recently and its link to Salafi ideology, they are classified separately with Wahabbism and Qutbism (even though all three are Sunni in nature). Seen as highly non-progressive, the Salafi ideology which is a mainstay with all 3 groups, hinges on the concept of removing ‘Bidah’ i.e innovation from Islam. Consequently, followers of these groups believe in strict adherence to the alleged ways of the Prophet often applying medieval concepts to modern scenarios. The Hanbalis are classified as Purist Salafis who practice strict adherence to Salafi Ideology but do not enforce it. The Wahabbists on the other hand are considered to be active Salafis often using Salafi ideology as a political tool to implement Shariah (Quranic law) and in some cases enforcing it. The most extreme form of Salafi ideology are the followers of Qutbism who consider Salafi ideology as a basis for waging Jihad (Holy War) against all non- believers. Founders: Imam Jafaar al Sadiq, Imam Ismail Jafaar and Imam Zayd respectively. They represent about 10-11% of the worldwide population of Muslims. How they are different from others: Quranism is different in that they reject the hadith (Book of sayings and actions of the prophet) completely. Consequently, the norms of prayer and general Islamic philosophies come from an individualistic interpretation of the Quran. Popular Islamic practices such as Polygamy and circumcision for instance are not allowed as it is not mentioned in the Quran but only in the hadith. 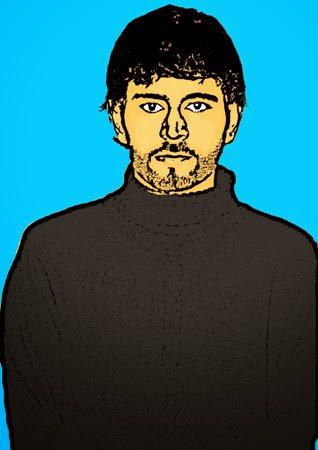 Ibadism is a breakaway group who are considered to one of the first groups to distance themselves from mainstream Muslims. There are minor differences with the Sunni groups on prayer and other aspects. Some say they are descended from the Khwarajites who assassinated Ali, however there is no conclusive evidence on this. 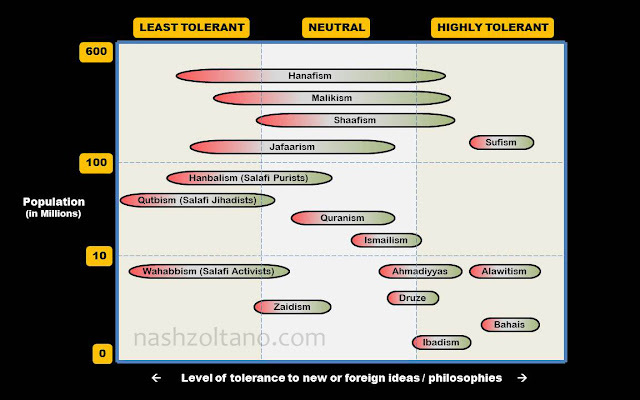 Figure B below shows how these sects tolerate new or foreign ideas and concept by measuring the perceived level of toleration to the population. It can be inferred that less than 1% of the Muslim population in the world today are classified as highly tolerant. For the most part Muslims are neutral with a small percentage (about 10%) bordering the non-tolerant zone leading to extremism. It should be noted that many groups that are defined here as Islamic are not regarded as such by a majority of the Muslim population. They, however fulfill the primary requirements of Islamic belief and hence are classified as Muslims. For example, many Sunni Muslims who fall under Qutbism or Wahabbism generally do not recognize the Shia as Muslim. Similarly both Sunnis and Shias, do not identify with groups such as Sufis and Ahmediyyas brandishing them as heretics. The red and green representing the two extremes. For example, Within the Hanafi school of thought, while the majorities are Muslims who integrate well with modern societies, there are a few such as the ‘Deobandis’ who practice a stricter form of Hanafism as seen in the case of the ‘Taliban’. With the Islamic event of Mid-Shaban having just passed us this week (June 3rd-4th), a few sources like discoveringislam.org are of the opinion that this would be the year that the Mahdi will appear. The conditions are ripe according to them, with Syria currently in a devastating war, an event prophesied by the Hadith as a condition for the arrival of the Mahdi during the Mid-Shaban. 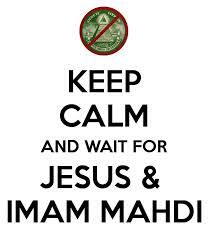 For the uninformed, Mahdi in simple terms is Islam’s answer to the modern messiah and just like Christians expecting the return of Jesus, there is a lot of anticipation building on the Mahdi’s arrival, given the state of the world today. According to the Hadith, the period of the Mahdi’s arrival will also coincide with the return of Jesus and an entity known as ‘Dajjal’, who for years has been speculated to signify everything from a deranged person to technological innovations like the internet / TV to even countries like the U.S and Russia. Whatever ‘Dajjal’ maybe, we know that it contrives in propaganda, imparting suffering and sin. If I were to look at all this rationally, it might all seem far-fetched with inklings of some extraordinary story told by the Bedouins of Arabia but you cannot take away the fact that these narrations have accurately predicted the fall of modern day Iraq, Syria and more recently Yemen, three regions which at the time of the prophet were hugely successful. “He (Dajjal) would be twisted and blind in one eye…. He would appear on the way between Syria and Iraq and would spread mischief right and left….. We said: Allah's Messenger, how long would he stay on the earth? He (ﷺ) said: For forty days, one day like a year and one day like a month and one day like a week and the rest of the days would be like your (normal) days….and it would be at this very time that Allah would send Christ, son of Mary, and he will descend at the white minaret in the eastern side of Damascus wearing two garments lightly dyed with saffron and placing his hands on the wings of two Angels." It appears from these extracts that the sequence of the timeline would be Mahdi's appearance for 7 to 9 years, post which Dajjal and Jesus appear. Based on a continuing paragraph, Jesus and the Mahdi will then kill Dajjal at the gates of Lud in modern day Tel Aviv Israel. I understand from this text that Israel will also be involved somehow which doesn’t seem likely if we were to take 2015 as the year of the death of Dajjal (considering that Tel Aviv is now covered by a blanket of security). I also noticed that the word ‘day’ in Arabic in the text about Dajjal is actually translated to ‘period’ which could mean anything but let us assume for the purpose of this discussion the definition of ‘Period’ as per the Quran i.e 1000 Earth years. In other words, 1 day/period in the sight of God is equivalent to 1000 earth days/periods. It follows that the Dajjal will be alive for 40 days/ periods where the first period/ day is equivalent to 365,000 Earth days (1 year), the second period/day is equivalent to 30,000 Earth days (1 month) and the Third period/ day is equivalent to 7000 Earth days (1 week). The remaining 37 days will be 37 Earth days. This sums up to 1101 Earth years. The Prophet (ﷺ) said: "The greatest war, the conquest of Constantinople and the coming forth of the Dajjal (Antichrist) will take place within a period of seven months." We know from history that Constantinople fell on May-June 1453 which means the Dajjal would have appeared 7 months later that is in 1454. If we add the 1101 years, which we got from before, the death of Dajjal is roughly placed in the year 2555. This means that Mahdi would appear 7 to 9 years prior which is either the year 2548 or 2546. This is all speculation at this point and I truly believe that the Almighty knows best, however if my calculations are right, it would mean that the state of affairs in Syria may not improve for the next 500 years which is really disheartening unless there is a scenario where the situation improves and then deteriorates around the year 2548 to match the prophecies of the hadith. In any case, I am convinced that 2015 is in no way significant and we have many centuries to go before we enter the final days of our existence as a species. I leave it to the Almighty to decide when that might be.